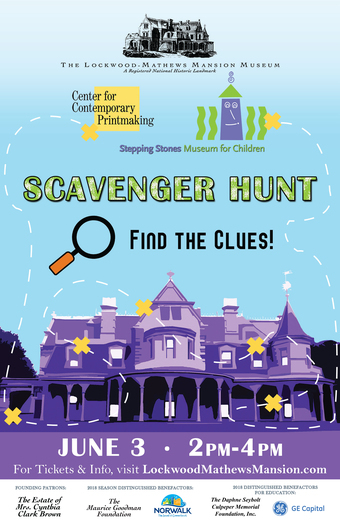 Norwalk, CT - The Lockwood-Mathews Mansion Museum will launch a Scavenger Hunt in collaboration with the Center for Contemporary Printmaking and Stepping Stones Museum for Children on Sunday, June 3, 2-4 p.m. at Mathews Park, Norwalk, CT. Participants will search for some of the most mysterious symbols, architectural details, objects, and history on the exterior facades of all three buildings and inside the Mansion. Visitors will find the clues, solve the riddles, and unlock the mysteries, which will often be hidden in plain sight. “This will be another exciting, fun way for people to learn about the Mansion, its history, and architecture, and experience Mathews Park and our great neighbors, CCP and Stepping Stones Museum for Children,” said Executive Director Susan Gilgore. A-Game and power of observation to win the top prize! Children must be accompanied by an adult or legal guardian. Scavenger Hunt tickets are $5 per person and participants may begin at any time within the 2-4 p.m. time frame and complete the tour at their own pace. All tickets for the Scavenger Hunt include admission to the museum. No discounts can be offered to LMMM members but participation will serve as a donation to a great cause! “We look forward to seeing the scavenger hunt participants at the Center for Contemporary Printmaking. While on the hunt, they will learn more about our building’s rich history as the original carriage barn for the Lockwood-Mathews Mansion as well as CCP’s own history having established itself as a respected studio and exhibition space in support of printmaking where they can come and see firsthand what is involved in making fine art prints,” said CCP Executive Director Kimberly Henrikson. The Lockwood-Mathews Mansion Museum is located at 295 West Avenue in Norwalk. Student tours are offered February through December. For more information on the Scavenger Hunt and tours and programs please visit www.lockwoodmathewsmansion.com, e-mail info@lockwoodmathewsmansion.com, or call 203-838-9799. The Museum’s 2018 cultural and educational programs are made possible in part by generous funding from LMMM’s Founding Patrons: The Estate of Mrs. Cynthia Clark Brown, LMMM’s 2018 Season Distinguished Benefactors: The City of Norwalk, and The Maurice Goodman Foundation; 2018 Distinguished Benefactors for Education: Daphne Seybolt Culpeper Foundation and GE.